Nearest: Tube Station: Bayswater 316 yards (288 metres), Railway Station: London Paddington 0.6 miles (1 km), Motorway: M4 Junction 1 4.1 miles (6.6 km). There are 4 tube (underground) stations within half a mile (0.8 km). The Grand Plaza Aapartments Bayswater London are located between Queensway, Westbourne Grove and Notting Hill in an area very popular for budget accommodation. All of the surrounding area offers a large selection of bars, restaurants and shopping with the covered Whiteley's Shopping centre on Queensway particularly popular. The major railway station of Paddington is just over half a mile away, and its from here you can take the Heathrow Express directly Heathrow Airport. This is a central location, just North West of central London. Just on the other side of Bayswater is Hyde Park, a large and popular park with a lake and boating weather permitting along with a gallery and many art works dotted around. Nearby attractions include the Portobello Antiques Market (0.3 miles), Kensington Palace (0.7 miles), Alexandra Fleming Laboratory (0.8 miles), Linley Sambourne House (0.9 miles) and the Royal Albert Hall (1 mile). The Grand Plaza Apartments Bayswater retains the splendid original Victorian facade having been made up from a former terrace of townhouses. It was actually thirteen townhouses and the period stucco frontage is retained. The apartments cover over 105,044 square feet. Room amenities include wireless internet access, dataport, Hairdryer, Hi-fi system with CD player, direct dial phone with voicemail facilities, ironing facilities, desk, satellite television with PPV, safe, Individually controlled heating, coffee/tea facilities, safe, Microwave Oven and Refrigerator in a kitchenette area (with utensils). Apartments decor consists of light colours with white fabrics, wooden furnishings and art prints. Apartments for up 4 people are available (where specified) and these have either 1 double bed or two twins and one double sofa bed. There are furnished studios and 1-3 bed apartments available. The Grand Plaza Apartments Bayswater offers 24 hour front desk, on-site laundry facilities, dry cleaning and a grocery shopping service. Apartments are serviced and have business facilities. Lift within building. Complimentary newspapers in lobby. Wired internet is available in the hotel rooms and is free of charge. Complimentary wireless internet access throughout. Milesfaster ranking: 530th from 866 London hotels, and 247th of 328 four star rated hotels. If your mainly looking at apartments maybe have a look at the 196 Bishopsgate Apartments. It is 0.5 miles (0.8 km) away with rates from £145 having scored a guest rating of 82% and has: free WiFi. For a hotel that offers lower base rates take a look at the Chamberlain Hotel. 0.1 miles from here (0.2 km), has been rated at 91% by past guests and the hotels starting rates begin at about £87 (theres free WiFi too). Fancy something highly rated by its guests? We think the 5 Star South Place Hotel could be a good choice, it's only 0.7 miles (1.1 km) from here. The South Place Hotel has an extremely high guest rating of 97%, one of the best rated London hotels. 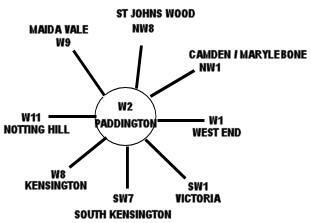 The 50 hotels nearest to this location (42 Princes Square, W2 postcode) that we list cover a 0.7 miles (1.1 km) radius. They include 1 five star hotel (rated 89%), 23 four star hotels (average rating 80%), 19 three star hotels (average rating 70%) and 8 two star hotels (average rating 66%). Of the local hotels the highest rated is Royal Park Hotel (4 star) at 90%. For the fifty local hotels we hold base rate data on all of them. The average starting rates for the surrounding area are around £101 per night. They range from a low of £11 at Smart Hyde Park View Hostel (2 Star, 71%) to a high of £720 at Commodore Hotel (4 Star, 60%). The breakdown by star rating shows the following averages: Five Star average: £169, Four Star average: £141, Three Star average: £72 and Two Star average: £44. Our in-house ranking based on guest ratings but adjusted for influencing factors ranks Grand Plaza Apartments Bayswater 23rd (joint) of the 50 local hotels and 19th (joint) for the 23 four star hotels in the area. For base rates the hotel ranks 40th of 51 (13th of 23 four star hotels.). Taking into consideration both rates and guest ratings we rank this hotel 39th of 48 of the local hotels in terms of value for money (Smart Hyde Park View Hostel was top). Bought in 2013 by State plantation giant Felda for £98 million pounds.